If the Willamette Valley could speak for itself, you’d be spellbound with its tales spanning thousands of years of history – stories of geologic calamity, rich Native American cultures and Oregon Trail dreamers. Salem’s Downtown Historic District is a seven-block area bounded by Chemeketa, High, Ferry and Front streets. Nearly 62 percent of the buildings downtown, 57 in total, contribute to the city’s history. At 11 stories tall, the Old First National Bank Building is hard to miss. It is downtown Salem’s only “skyscraper.” Built in 1927, the building has elaborate ornamentation – including griffins, a standing human figure and bearded human faces on the outside of the building. You can visit the Travel Salem Visitors Center on the first floor. Since its opening in 1869, the Reed Opera House has been a significant cultural and social center in Salem. The building has housed the Oregon State Supreme Court, the State Library, an auditorium, hotels, stores and saloons. Today, you’ll find boutique stores, art galleries, a ballroom and restaurants inside the building. Salem has an extensive network of underground tunnels. Throughout history, these tunnels were allegedly used for the transportation of goods, opium dens and socializing. The tunnels are closed to the public, but you may notice the purple glass blocks and large metal plates in the sidewalk, which allowed light into the tunnels. 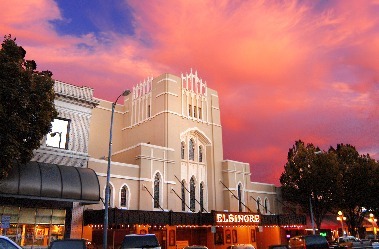 The Elsinore Theatre has served Salem for more than 90 years. Built in 1926, the theatre was the brainchild of George B. Guthrie, a Portland attorney and private art collector. His dream was to design the best and finest theatre in the city. From the moment you walk in, theatergoers can feel Guthrie’s dream come alive. The lobby of the theatre has murals designed to represent Shakespearean plays, grand staircases and stunning stained window glass. The theatre now hosts a variety of theatrical performances, live music and movies year-round. The Southern Pacific Railroad started building the Union Street Bridge in May 1912 with the goal of connecting Salem to the West valley. The bridge required a lift section because the river was heavily used for water transportation at the time. It is one of only a few Waddell & Harrington vertical lift railroad bridges in the state. The bridge permanently closed in 1980. Now repurposed as a pedestrian and bicycle bridge, it is one of two bridges that connects three Salem parks and more than 20 miles of trails. Built in 1887, the Gilbert House is one of two large-scale examples of Queen Anne architecture in the city. It symbolizes the prosperity of the children of Oregon Trail pioneers. The Gilbert House Children’s Museum, named after Salem native A.C. Gilbert, opened in 1989. A.C. was a world-renowned toy manufacturer, Olympic athlete and magician. The museum offers 15 hands-on exhibits, an outdoor discovery area and educational programs for children. Asahel Bush II, a pioneer banker, newspaper publisher and public figure, built the Bush House from 1877-1878 for his wife and four children. The 12-room home is Italianate in style, with elaborate woodwork, marble fireplaces and a veranda. 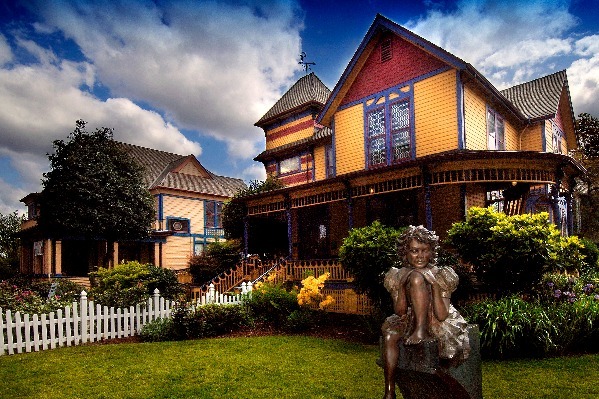 The Salem Art Association maintains the historic home and offers tours throughout the week. The home retains many original furnishings, embossed French wallpapers and brass fittings. It sits on a 90.5-acre park, Bush’s Pasture Park, with gardens, wooded areas and open meadows. The Lord–Schryver firm, founded in 1929 by Elizabeth Lord and Edith Schryver, was the first female-owned landscape design firm in the Northwest. Through their 40 years of work, the duo designed more than 250 gardens in the Northwest, including several in the Salem area. Gaiety Hollow was Lord and Schryver’s office, garden and home. It is considered the masterpiece of their life work. The gardens, which boast seasonal floral displays, are maintained by the Lord and Schryver Conservancy and are open to the public on select days throughout the year. Salem Pioneer Cemetery, also known as Odd Fellows Rural Cemetery, was first used in the 1850s. At 17 acres, it is the city’s largest historic cemetery, with more than 8,000 burials on record. Among the buried are prominent Oregon pioneers, who are credited with establishing the state’s first government and the capital city’s educational and social institutions. Salem hasn’t always been the state capital; both Oregon City and Corvallis once served as the state’s political center. Until a permanent location was decided on, the state went without a capitol building for 21 years. After Salem’s first two state capitol buildings burned down, construction on the present-day capital building began in 1936. Completed two years later, the marble building is an example of Modernist Art Deco design. Atop the capitol stands a 23-foot, bronze pioneer statue, which represents the independent spirit of Oregonians. It can be seen from miles away. The surrounding park features dozens of statues and monuments that commemorate the state’s history. Take a self-guided walking tour of the capitol and grounds or opt for a guided historical tour of the building and tower. 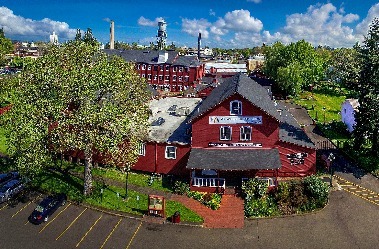 Fourteen historic structures are located on the Willamette Heritage Center’s five-acre campus. The Thomas Kay Woolen Mill, a National Park Service Designated Treasure, opened on the campus in 1889. The current mill building was built in 1896, after a fire destroyed the original mill. After decades of producing flannels, blankets, tweeds and cassimere, the mill closed in 1962. It remains one of the only plants capable of demonstrating an entire manufacturing process by direct-drive water power in the United States. Several other early settlement buildings, including two of the oldest standing wooden frame houses in the Pacific Northwest, have been moved to the campus. Self-guided tours are available six days a week. Known in the 19th century as the Oregon Insane Asylum, the Oregon State Hospital is the oldest mental health hospital in the state. It sits on a 130-acre campus right outside of downtown Salem. The hospital is still in operation today. The public can tour the hospital’s museum of mental health to hear the stories of the hospital and the people who lived and worked there. In pop culture, the hospital was made famous in the film “One Flew Over the Cuckoo’s Nest.” The Academy Award-winning movie was filmed at the hospital and featured several staff members and patients.